A virtual Banksy Gallery has been launched in the Topaz region of Second Life (Topaz/89/34/28.) Charlie Backwell (aka Charmarley Nightfire) from Bristol has launched an area in Second Life called "Banksy's Ghetto" where 400 virtual pieces of Banksy's work are on display. 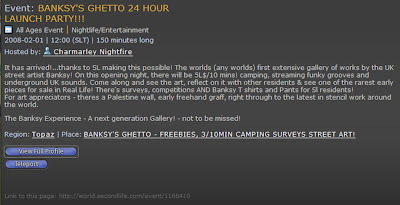 "Event: BANKSY'S GHETTO 24 HOUR LAUNCH PARTY!!! The worlds (any worlds) first extensive gallery of works by the UK street artist Banksy! On this opening night, there will be 5L$/10 mins! camping, streaming funky grooves and underground UK sounds. Come along and see the art, reflect on it with other residents & see one of the rarest early pieces for sale in Real Life! There's surveys, competitions AND Banksy T shirts and Pants for Sl residents! For art appreciators - theres a Palestine wall, early freehand graff, right through to the latest in stencil work around the world. The Banksy Experience - A next generation Gallery! - not to be missed." Think this is a clever way of using Second Life and I think Banksy's Ghetto will be a popular destination. I have enjoyed walking round tonight (see the screengrabs below) - thank you Charmarley! stored in an acid free folder in my smoke free home. I ship with FedEx worldwide.